Interim boss Mick Harford has confirmed the Hatters will be at full strength this evening against Sheffield Wednesday to give them the best chance of a ‘massive’ tie at Premier League giants Chelsea. Town take on their Championship opponents at Kenilworth Road in an FA Cup third round replay, with the knowledge that the winners head to Stamford Bridge on Sunday, January 27 for a fourth round tie, the game also broadcast live on BBC. Harford, who will be without striker Danny Hylton, suspended for four games, said: “We respect the FA Cup and we will pick our strongest team that’s available to try and beat Sheffield Wednesday. “The lads had a real good go at it last time and know what they’re coming up against. “It’s massive, absolutely massive, it’s something we’re desperate to do (play Chelsea). "We’ll put our strongest team available out and try to win the game against what I believe is a real good Sheffield Wednesday team, when they get it right. "So it's a big challenge for us, it’s a journey. We know we’re near the fourth round, if we beat Sheffield Wednesday, that will be four teams we’ve beaten and on to the next one if we win. "But it’s a big ask, a massive test for us and it’s again, we’d be going to Chelsea and taking 10,000 fans down there and it is a massive carrot for everyone. “It’s big month for us and I’ve stressed that to the players. "We’ve given ourselves a great opportunity by going up to Sheffield Wednesday and performing to a good level against what I believe is a good team as I actually watched them at West Brome when they drew one each, I thought they were excellent on the afternoon, and deserved probably to win the game. 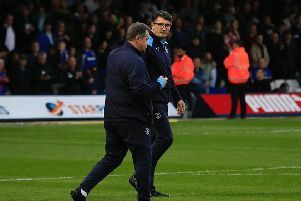 Harford’s last game in charge at Kenilworth Road during his previous spell in charge, was for a 1-0 home defeat by Stevenage in the Conference back in October 2009. Although he has ruled himself out of the running for the main job, he can’t wait to get back in the dug out once more this evening after leading the side to a 1-1 draw at boyhood side Sunderland on Saturday. He continued: “The hairs stand up on my back when you mention the game. "Saturday was a magnificent experience for me, my hometown club, my family were there, three and a half thousand Luton Town fans too. "It was quite a strange experience as two sets of fans quite like you. "So to walk out in front of a full house (tonight), against a real, real good team that will be a good test for us, it's something I’m really looking forward to and am going to embrace it. “I didn’t expect this role, I was put into it, I’m privileged to do it, it’s an honour to do. "It’s been a bit of a whirlwind, as I didn’t expect to be sitting in front of you guys doing the press as manager of Luton Town. With the Owls selling out their 1,500 tickets for the clash, it should be a sell-out, and Harford is anticipating a marvellous night. On why it will be so special, he added: “It’s just the atmosphere, the fans are great, it’s a real tight ground, an old fashioned ground, it’s those Luton fans that create a special atmosphere. “I know 100 per cent what will happen, the fans will turn out once again as usual and get behind the team, give them a big push, the way they always do. "Just look at them on Saturday, they were amazing. Kenilworth Road, I've played a few games there under the lights, it’s a daunting experience sometimes when the team’s doing well down there.